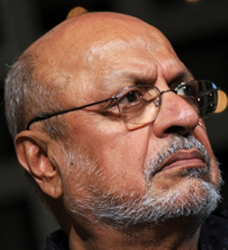 Shyam Benegal was born in Andhra Pradesh in 1934. He was initially involved in the advertising industry and produced over 900 advertisements- Lintas Advertising (1959-63) and Advertising and Sales Promotion (1963-73) . He got a chance to work as associate producer for Children's Television Workshop in New York and Boston WGBHTV. Later he turned to films following the footsteps of his uncle, the great Guru Dutt. Benegal's first film 'Ankur'(1973) introduced Shabana Azmi into the film field. The film won wide critical acclaim. Most of his films portray oppressions in society. His other famous films are 'Nishant'(1975), 'Manthan'(1976), 'Bhumika'(1977), 'Junoon'(1978), 'Kalyug'(1980), 'Aarohan'(1982), 'Trikaal'(1985), 'Susman'(1986), 'Yatra'(1986), 'Antarnaad' and 'Suraj Ka Satwan Ghodain'(1992). Shyam Benegal has won several awards for his contribution to the films. He has also directed many documentary films and a television series 'Bharat Ek Khoj' based on Jawaharlal Nehru's Discovery of India. His documentary includes 'Making of the Mahatma' - a study of the early years of Gandhi in South Africa, Sruti and Graces in Indian Music etc. He has also taught at the Film and Television Institute in Pune.